Pharma Franchise For Cardiovascular Medicines – With increasing cases of heart problems and disorders across India, the cardiovascular drug market segment is pacing its value in millions. You can opt to become a part of this segment by choosing Biofield Pharma ‘leading pharma company in India. We provide you affordable pharma franchise for cardiovascular medicines range. These include DCGI approve tablets, capsules, syrups, softgels, oral suspensions etc. Our company welcomes all those who seriously want to start their own business venture in their desired location in India. A double-digit growth is expected in cardiovascular drug market across India in 2018. It has been reaping high profits for all those who have their business here. Biofield Pharma brings you pharma franchise for cardiovascular medicnes/products ranges at most genuine investment plans. These medicines have been prepared in GMPc & WHO spacious units that are filled with dedicated departments, modern equipment, eco-friendly base, skilled manpower etc. By being a PCD franchise in medicine to treat a heart problem, you will get monopoly rights, better profit income, incentives, and marketing tools. You will be supported throughout the journey is the aim of the company. If you want to discuss the possible deals near your location then directly call us on our phone number +91-9216300566, +91-9216300166. You can email your queries at info@biofieldpharma.com for more details. Advancement in science and medication capabilities to treat heart ailments. Newer and better drug discoveries. Effective drug administration and modification over years. Strong awareness among general public about these problems and medication available. You will be offered DCGI approved drug medications that prepared under expert guidance. The medicines are prepared in GMP & WHO manufacturing units that owned by a company in excise free location. Quality APIs and extracts are used in making cardiovascular medicines. Thorough quality testing for impurity, defects and any deviations are ensured. This helps maintain reliable and effective drug solutions for our patients. Different warehousing and storage facilities are provided to each batch corresponding to the dosage unit. 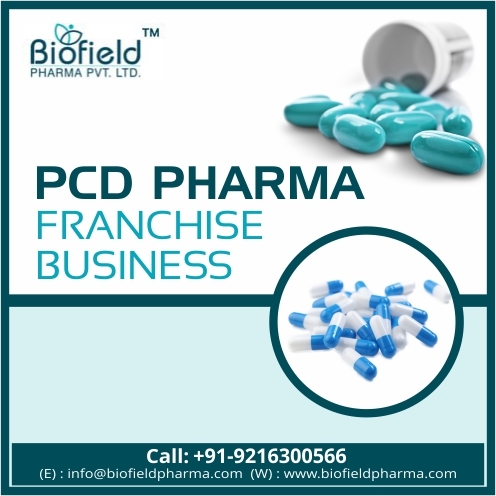 Why Choose Biofield Pharma for Pharma franchise Business Opportunities? Offering monopoly rights across India in different locations like Mumbai, Chennai, Sikkim, Gujarat, Chandigarh, Haryana, Arunachal Pradesh etc, Biofield Pharma invites hard working and dedicated people. Our company ensures that our ranges consist of different medicines that will help you cure, treat and prevent heart problems. As a PCD franchise owner, you will enjoy a good market for these medicines. Being a PCD pharma franchise owner of these medicines, you will enjoy great demand which is our promise to you. We will guide your way through for better opportunities where you can invest in the near future. You will be offered free of cost, a wide list of promotional tools for better marketing. Genuine prices set for our cardiovascular products range.